In our cover feature this issue we take a look at travel photography and the art of exploring new places. Find out which kit is essential for success, how to plan for a trip, how to capture citylife shots and how to make the most from wild environments, for dramatic images. Next take a look at Holly Wren's fabulous feature on working with people and become an expert on building a rapport, posing, using the location and overcoming key problems. Then explore Lauren Scott's feature on producing artistic self portraits. Go far beyond the average selfie and shoot breath-taking images by managing light, using in-camera effects and employing pro software skills. Plus we have our usual range of reviews, tutorials, interviews and career insight. Don't miss out on all of this essential professional-level advice. 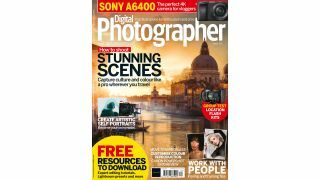 Get your copy of Digital Photographer now. You can get your copy of Digital Photographer in most great newsagents but you can also find us online. Find us on Facebook and Twitter and why not subscribe to Digital Photographer, to ensure you never miss an issue?